Over the course of the last 3 posts, we proceeded from eco-feedback mechanisms to a paranoid vision of automated prisons and crowd control. It’s worth taking a moment to step back and consider the plausibility of all of this. How likely are these things? Would we do it? To make grand architecture is to shape the world in your image, in the hopes that it will in turn shape people. This can be benevolently nudging the population in one direction, or forcing them into another, but that’s simply a question of degrees. To remake a space is to make an ethical claim on how that space should be used, by whom, and for what purpose. At every step along the way, builders have used cutting-edge technologies to bring their manifestos to life. You can’t throw a rock in the Architecture section of a bookstore without hitting a tome that talks about patterns of architecture and how they make people harmonious or otherwise. See also the architecture of every religion, ever. Security and crowd dispersal was at least one of the factors that guided Haussmann’s Paris redevelopment. In Iran, wide boulevards made it similarly difficult for protesters to assemble. Henry Ford built an entire village in the Amazon Jungle on the strength of the idea that he could create a perfect society with the right kinds of construction. Think all of this is too totalitarian? Too historical? Take a look at these contemporary Mega Churches (click that link, you will not regret it). CCTV tech is rampant. Roads are giving you tickets automatically. 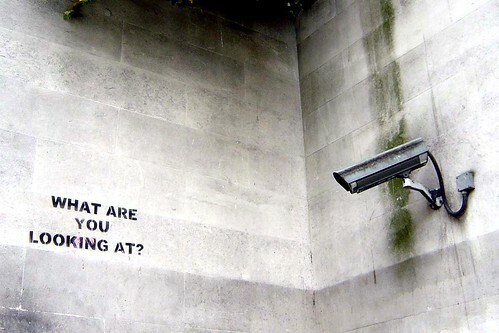 In Britain, CAMERAS ARE ALREADY TALKING TO YOU. Notice that I haven’t yet mentioned Nazi architecture. It’s because I didn’t have to.